Crawford Lake is one of a handful of meromictic lakes in Ontario and this fact led to the discovery of a pre-contact native village. It was snowing off and on as I parked in the Crawford Lake conservation area where having correct change would have saved me including a small donation in the envelope. In the late 1960’s a University of Toronto professor became convinced that Crawford Lake had the characteristics to be a meromictic lake. Most lakes have the water turn over at least once per year. As the water cools it becomes denser causing it to sink. The water at the top mixes with the water at the bottom providing a more even temperature and oxygenation. In meromictic lakes the surface area is less than the depth and the water doesn’t mix. In Crawford Lake there are three sections of lake and only the top 15 metres mixes annually. The middle depth of the lake acts as a buffer while the bottom 9 metres or more never gets disturbed. This part of the lake is always cold and has no oxygen. Life doesn’t exist down here and the layers of sediments tell the history of things falling in the lake. Samples taken from the lake bottom revealed 1,000 years of history. Sediment layers representing the period between 1300 and 1600 have high levels of corn pollen trapped in them in varying concentrations. This led to the conclusion that an agricultural society had existed near the lake, closer to the shore when the concentrations were higher. When settlers arrived, cut down the trees and created fields ragweed spread and the upper layers of sediment reflect this. Crawford Lake is calm in the picture below. Local land owners confirmed that they had found artifacts on their properties and when Thomas Howard sold to the conservation authority in 1971 he donated an ungrooved ax or celt he had found here. It is part of a 10,000 artifact collection that has been uncovered between 1973 and 1989. 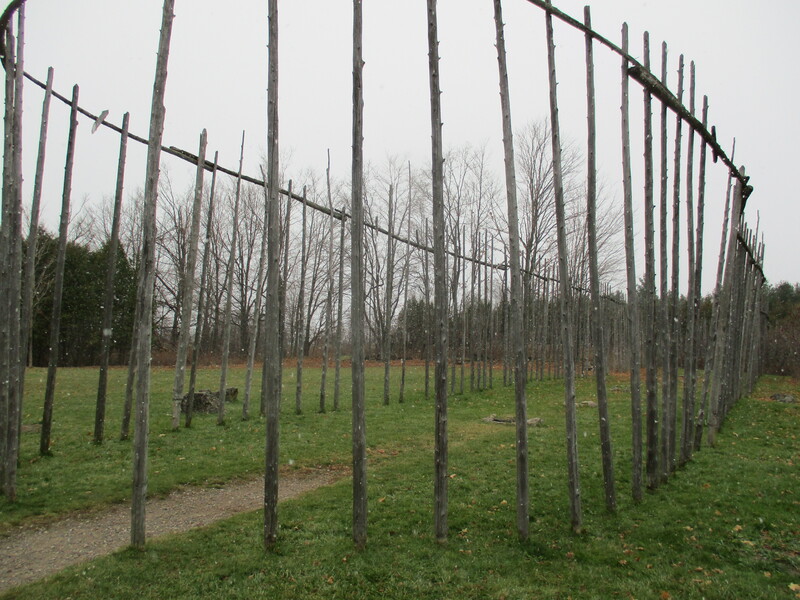 The post holes for the frames of 11 longhouses have been discovered and three of these have been reconstructed. Two others have been partially formed including the frame outline seen below. The positions of the fire pits have been exposed. 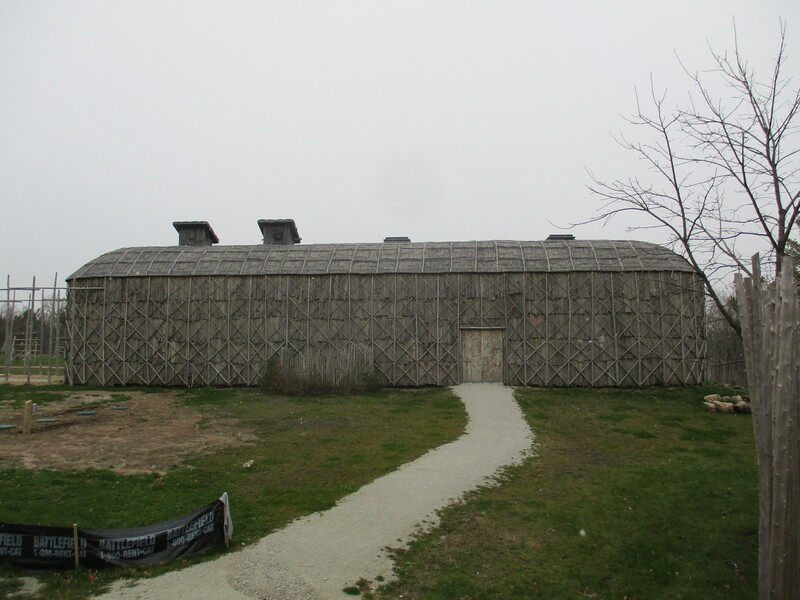 Completed longhouses would have looked like the ones at Crawford Lake except that experts agree there were no ‘panic bars’ on the doors and no little electrical outlets on the outsides. It is unknown exactly which peoples lived here. It may have been the Wendat (Huron) or Attawandaron (Neutral) but either way they were part of the Iroquoian speaking nations and are referred here as Iroquoian for simplicity. 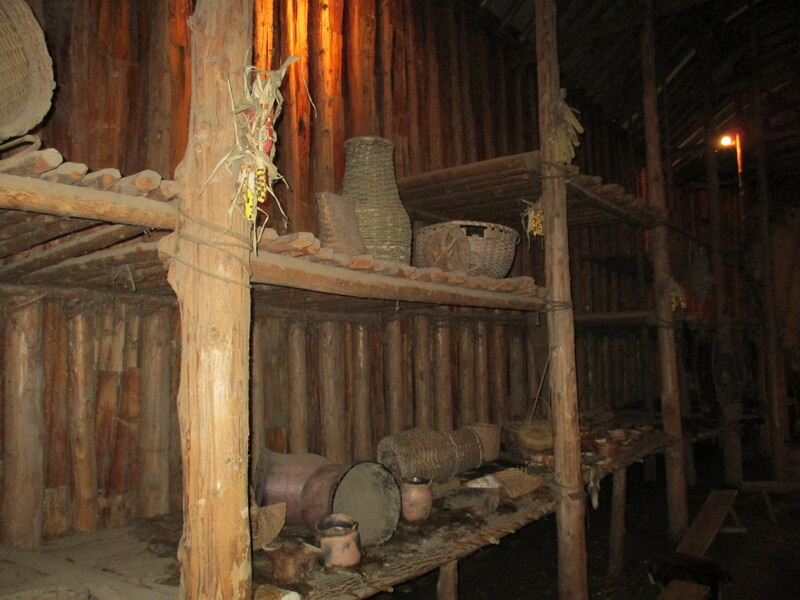 Inside each of the longhouses an individual clan lived. Smaller longhouses may have had 30 people while larger ones up to 100 . Individual families lived across from each other and shared a common fire. The lower levels were used to sleep on because they were close to the fire and below the constant smoke. Upper levels were used for storage with food being hung in the rafters where smoke kept both insect and rodent away. It is common to find the carbonized remains of food around the fire pits or in the dump sites and these frequently include corn, beans and squash. For some reason there was no squash found at the Crawford Lake village. The art of making stone tools is known as knapping. It took a great deal of skill to master it but then a piece of chert could be turned into a razor sharp projectile in just 15 minutes. 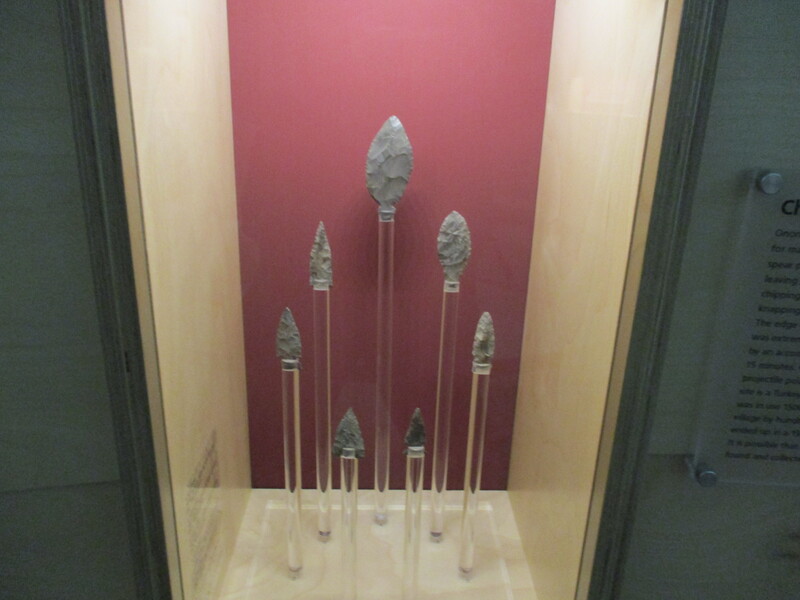 Along with arrowheads, spear tips, knives and drills were knapped. Among the findings at the site was a tip known as a turkey-tail arrowhead. It is out of place by up to 3,000 years suggesting that the idea of collecting antiques may have extended to this culture as well. The turkey-tail point is displayed along with other arrowheads and is on the tallest shaft in the middle of the picture below. Pottery was made by the women and the vessels could be as large as 15 litres. Each family decorated their pottery in a unique manner that was passed on from mother to daughter. Specific markings on pottery have been used to trace the movements of families and clans over time. 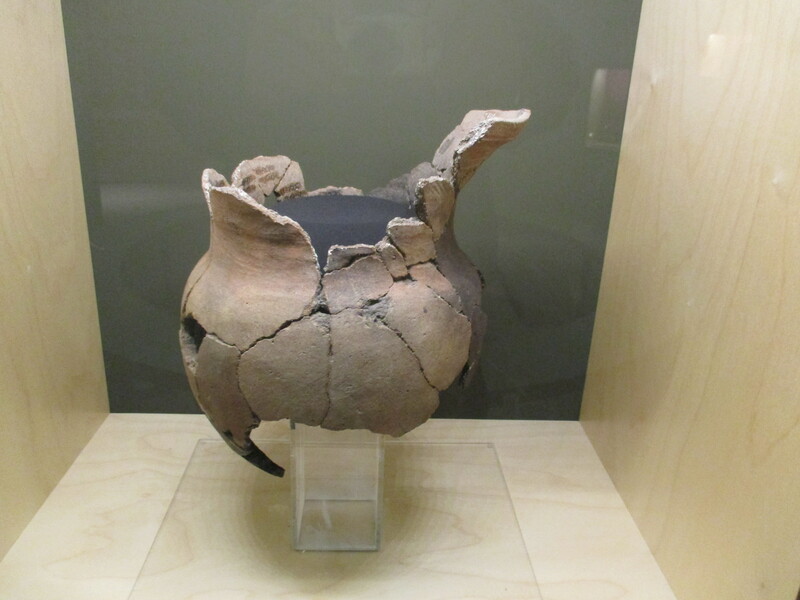 The pottery fragments recovered in the village have been carefully put back together including the 47 pieces of this jug. This tract of land was eventually sold to the British Crown to be granted to European settlers and the natives who had lived here for centuries would never return. 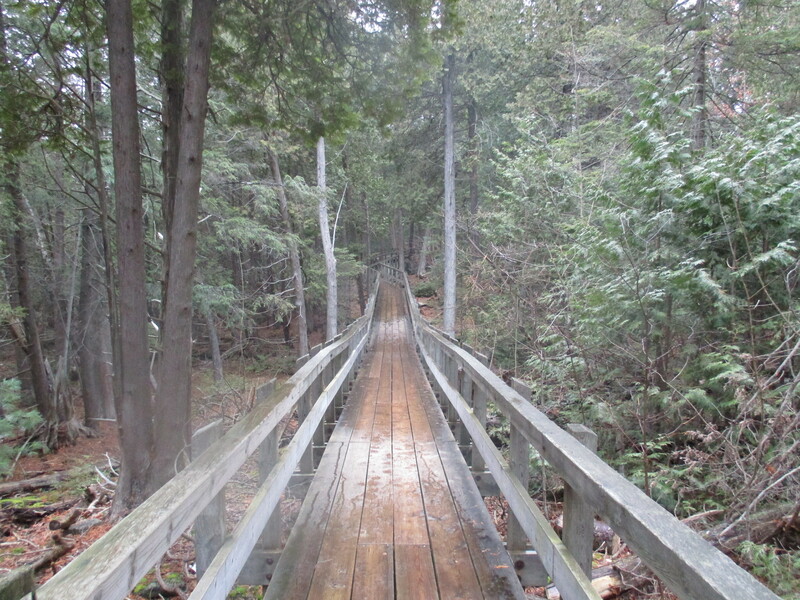 Along the Crawford Lake Trail is a series of wood carvings known as the Hide and Seek Trail. Ontario has almost 200 species that are considered to be at risk, seven of which are represented with larger than life wood carvings. 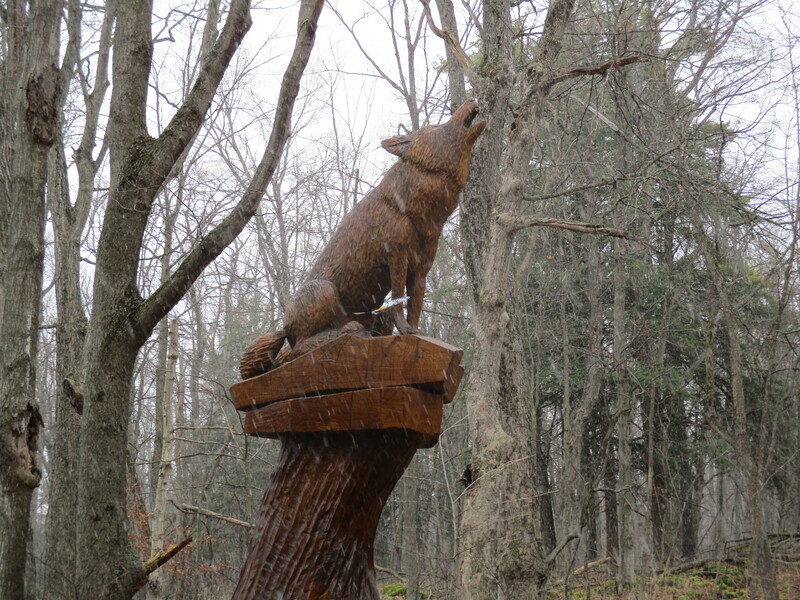 The Eastern Wolf in the carving below is pictured howling, as they commonly do, to communicate within their packs and alert other packs to stay away. They are found in Ontario and Quebec but are now predominantly in Algonquin Park. They are unable to survive in the small patches of forest left in the more urban parts of the province. In 1883 George Crawford bought the lake and 100 acres of land which he transferred it to his son Murray a couple years later. They operated a saw mill on the south end of the lake to take advantage of the ample timber on the surrounding lands. In 1898 the name of the lake was changed from Little Lake to Crawford Lake when they opened the Crawford Lake Company. When times were tough during the depression the Crawford family ran a resort on the lake. They also built themselves a cottage and boathouse. In 1969 the lake and property was sold to the conservation authority and the cottage has since been destroyed. All that remains is the concrete from the front porch and a set of steps leading down to where the boathouse once stood. 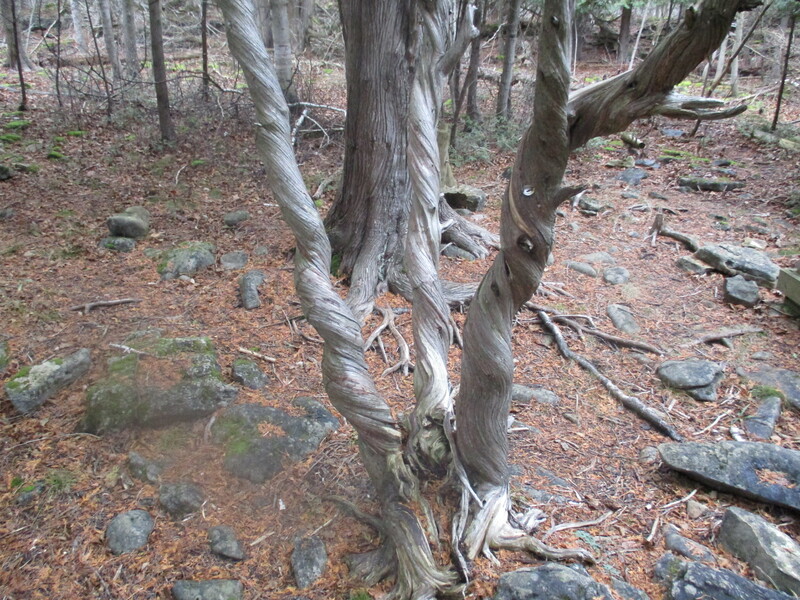 This cedar tree stands along the side of the trail and is unique in that all three stems are twisted from top to bottom. 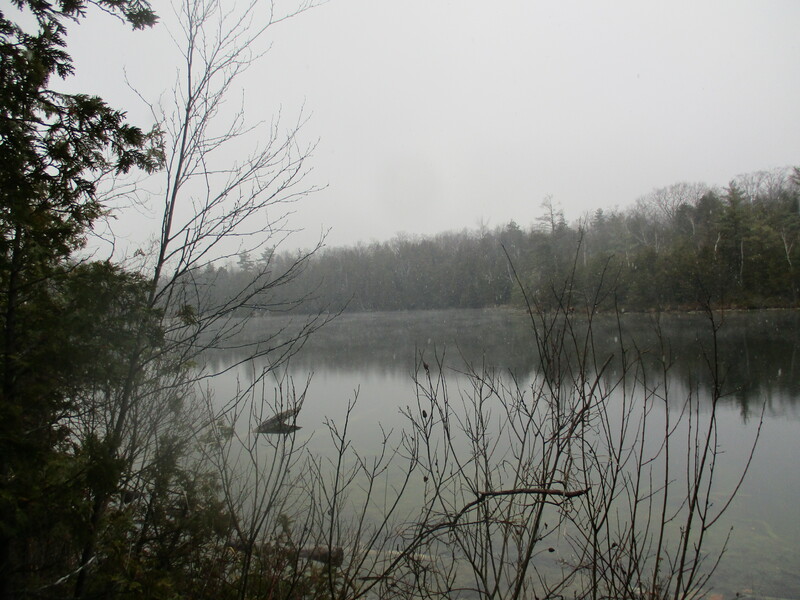 Crawford Lake was formed at the end of the last ice age and has been collecting it’s local history lesson ever since. 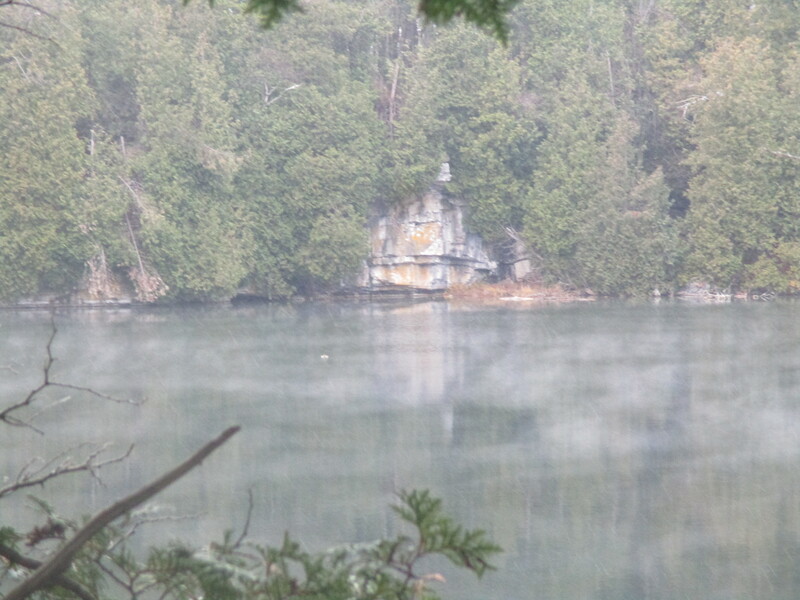 Steam was rising off of Crawford Lake even as the snow was falling onto it. Crawford Lake Trail and the interpretive reconstruction of the Iroquoian village has been made wheelchair accessible so no one has to miss out. I only investigated the village and Crawford Lake Trail but the conservation area contains 7 hiking trails including part of the Bruce Trail. It looks like you can spend a whole day here and still miss things. 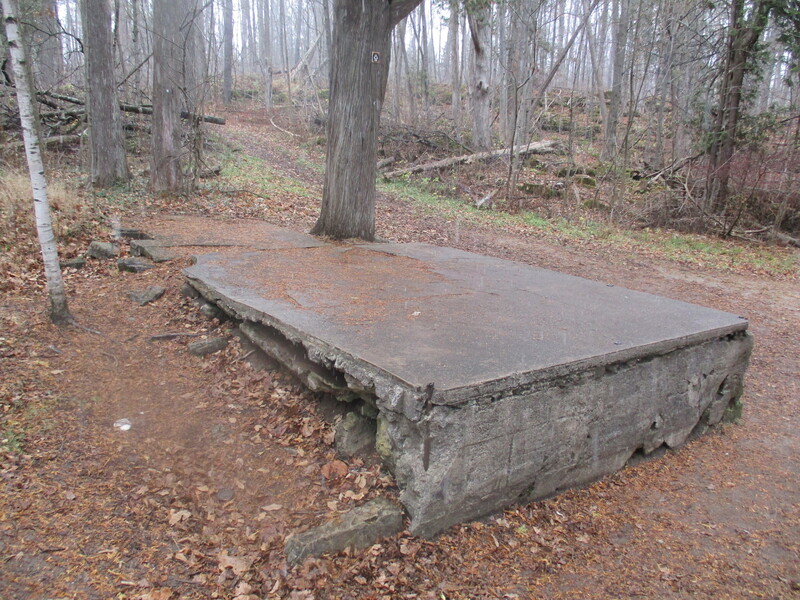 This entry was posted in Historic Site, Uncategorized and tagged Crawford lake, Eastern wolf, Halton, Iroquois, knapping, Longhouse, meromictic lake, turkey-tail arrowhead on November 24, 2015 by hikingthegta.